While I've never used any preamps like the Triton Audio Fethead Microphone Preamp or the Cloudlifter CL-1, I was really impressed with the amazing amount of boost to the sound. The large dose of extra gain can make help a budget microphone/preamp combination sound clean and more professional. Some microphones such as the Heil Pr-40 and the Sure SM7B are known for really low outputs. This creates a situation where you have to turn the gain up on your mixer or recording device. This can leave the door open for added hiss depending on your mixer or recording device. The Simply Sound SS1 is designed for dynamic microphones only. As I had said, never using any preamp (besides the one in my mixer, and I've also used the DBX 286, and the Aphex 230) even without a preamp, I never thought I sounded bad. With that said, the concept makes sense. I know that when I turn the gain up on any mixer there comes a point where noise is introduced. Using the SS1, I basically turned my gain all the way down. The construction is super rugged and resembles the Cloudlifeter all-metal casing (but cooler looking in black) you're not going to break this. 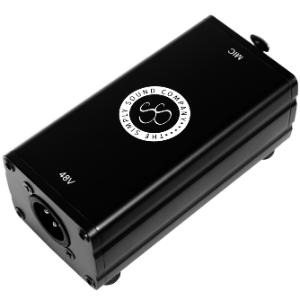 You do need some phantom power (so a typical route might be to plug your microphone into the SS1. Then plug the ss1 into your mixer. The mixer would need to have the Phantom Power Turned on. For my recording today I had my EV Re320 going into the SS1 and that went directly into the Zoom H5. It was an amazing amount of boost. How I did the test. I set my levels using the H5 recorded some audio, removed the SS1 from the chain, and plugged it back into my Zoom H5 without touching any knobs. Do you NEED this? As with all things podcasting, it depends. If you're happy with your audio, no. If you struggle to get enough signal into your recorder, or the sound has a fair amount of noise, then this is well worth the money. So the proper procedure would have Phantom Power off. I no longer recommend Appendipity themes. This is a theme I loved and have on most of my websites. The face of the company Joey Kissimmee was last seen online in late 2016, and they are no longer replying to any support emails that I send. Unfortunately, this is not the first time I've done this. Semiologic was a cool theme until Thesis came out. Then they went from needing no knowledge of code to having to know a ton of code. I really like Appendipity themes as there was a lot of flexibility (and no need for knowledge of code). I love the Divi theme, but they come close to having too much flexibility and people can get overwhelmed because it does everything (and the learning curve can be a bit large). 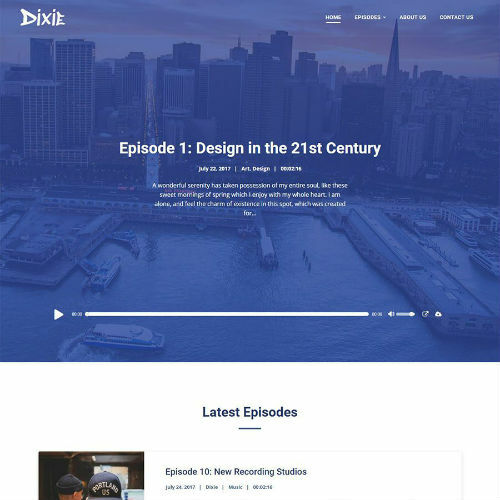 Divi is a well-managed theme, with a huge community and awesome support. You can join Elegant Themes (the creators of Divi) for $89 a year. I did the one time fee of $249 for lifetime access. In addition to their themes, they have some cool plugins. One thing I just discovered is when you purchase a Second Line Theme, you can only use it on one website. This puts it int the “Depends” situation. The good news there is a one time fee. On the Evanto market, it shows six months of support with extended support for $17.63 a year. If you have multiple sites (for me I have at least four) that can add up ($59 X 4 = $236). So far Second Line support has been great answering all my questions. The theme I'm using (Dixie) is skewing my featured image. When I informed this of the problem, they told me exactly what to do if I wanted to edit some files. The means you're going to need to understand FTP, and not be afraid to edit some code (always make a backup of any files you are editing when it comes to theme code). I was surprised that the theme allowed a featured image to be skewed disproportional as I don't know ANY designer that would allow an image to be reshaped (and if you have any text on your image it makes it blurry). While the Second Line theme makes it easy to set colors, headers, and the theme seems to make it possible to adjust everything (except a skewing featured image…) what I also found amazing was a free plugin that they recommend you use (and they have some built-in features for it ) called Elementor. This is an open source page builder (That looks a lot like, Divi). This will work with most themes, and its a super easy drag and drop page builder. The cool thing is you can use that plugin on any theme. I hear people that advise new podcasters and they try to sell people packages and strategies that work for them. The problem is they are not you. For example, as I have multiple websites, I might lean toward Divi over Second Line. If you had one website, then a like Dixie or Satchmo might be just the trick if you only have one website. It might be a better fit for you. Libsyn rolled out new stats back on September 18th. NOTE: Libsyn sent out an email to all Libsyn users on September 18th – if you did not see that email – you might want to check your spam folder. It would have gone to the email registered to your Libsyn account. The conversation starts right after the promo at the 52 Minute mark. Yukifumi Touya, Digital Advertising Consortium Inc.
Bosko Milekic, AdGear Technologies, Inc.
Francois Fortin, AdGear Technologies, Inc. The Interactive Advertising Bureau (IAB) empowers the media and marketing industries to thrive in the digital economy. Its membership is comprised of more than 650 leading media and technology companies that are responsible for selling, delivering, and optimizing digital advertising or marketing campaigns. They were up to deal the next hand and they stated that “downloads are wild” and everyone went “WHAT?” at the table and they didn't want downloads to be wild. For the industry to be able to move forward, the table had to come together and decide on what would constitute a download. Their answer can be seen in this report. They are currently working on a second version. If you were going to “Sit at the table” you had to agree to the terms and they all did. Much like when the music industry went from Cassettes to CD's it was a pain. This meant we had to buy all of our favorite music again. But the audio was better. As a music listener, I had no choice but to buy a CD player. It's the way the industry went. Could Libsyn communicate better? I guess so, there is always room for improvement. It gets tough as no podcast company is going to peel back the curtain 100% as if they tell you how they do their stats, you open the door for people to game the system. I personally don't know the formula (I just help you “drive the car” as a Libsyn support person, I don't build it). This is similar to the guy who throws the chicken in the Fryer at KFC. He knows hows to cook the chicken but has no idea what the 11 herbs and spices are. I did a test over the last few weeks, and I released an episode that had tracking from Libsyn, Podtrac, and Blubrry. In a recent episode of Podcast Ninja, Todd Cochrane explained how years ago Podtrac, Blubrry, and Libsyn came up with specs for an organization for the Association of Downloadable Media (it starts at the [11:44] mark ). So for years, Podtarac, Blubrry, and Libsyn were close in numbers. Fast forward to today and due to how apps are now consuming media it appears that the larger the file size, the greater your numbers were being inflated. So last week I sent out a file that I encoded at 320 kbps (DO NOT DO THIS) and here are my numbers after 24 hours. If you click into the episode on Blubrry you will see the number of 1247 unique downloads which is closer to the IAB standard that Libsyn and Blubrry are using. I know it is quite a blow to your ego to have the total number of downloads decline, in some cases, people are losing large amounts of their audience. The truth is the same people that listened to your last episode are listening to your current episode. The way it is reported is different. In a way, it's like if we all told time in minutes. There were 1440 minutes in a day, and then everyone decided to tell time in hours and agreed there are 60 minutes in an hour. So now there are 24 hours in a day. That sounds like a lot less than 1440, but I didn't lose any time. I just changed the way I report it. Obviously, those who have CPM deals with advertisers are in a completely different situation. Remember that some of the people on the IAB technical board were from companies like Midroll, Adswizz and other advertising companies. It doesn't make it any better, but they should have an idea of why this is happening as they were they during the planning. As I said, any time your numbers go down, it hurts. Hang in there, they will go back up (if you look at the Edison research on podcast listenership on the graph there is one year where it shows the numbers went down – why? They changed the criteria). In the long run, the podcast industry will benefit from this move. I was recently in the Libsyn headquarters in Pittsburgh PA, and I got a brief tour of the new stats. It looked very impressive as libsyn continues to bring you the best media hosting in the industry. Use the coupon code sopfree. Ready to Start Podcasting Now? $49/month or get two free months when you sign up for a year. Hello, came across this post while searching for info on what happened to Appendipity. I’ve used their Maron theme for a few years and love it but like you mentioned in your post above Joey has been MIA for going on 3 years and now their website is history and support has long been non-existent. I’m not having any issue with Appendipity (yet) but I’m anxious to switch to another theme before Appendipity starts to break with new WP updates since it appears to no longer be supported. Such a shame. It’s a great podcast theme. Thanks for the info on Second Line. I have Divi so I’ll probably try them first but Second Line has some nice looking themes so glad to have a Plan B.